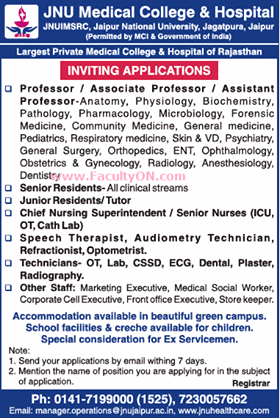 JNU Medical College and Hospital, Jaipur has advertised in Times of India newspaper for the recruitment of Professor plus Associate Professor plus Assistant Professor jobs vacancies. Interested and eligible job aspirants are requested to apply with in 7 days. Check out further more details below. About College: University approved by UGC after inspection under clause 2(f) of UGC 1956 Act. First Private University of Rajasthan accrediated by the NAAC, based on very comprehensive evaluation after only 7 years of establishment. Ranked amongst top 30 Best Universities in the county by INDIA TODAY 2015. Ranked amongst top 20 Private Universities of India & first in Rajasthan. Accredited by American University Accreditation Council (AUAC) and International Accreditation Organization (IAO). University having membership of Association of India Universities (AIU).